Tea Happiness- A blog on tea drinking, tea history, tea industry interviews, NYC tea experiences! : Who Had The First Sip? Who Had The First Sip? I always assumed tea was first consumed in Britain before ending up in the American colonies. It's honestly not something I wondered much about until I was doing a bit of research for last week's post, and came across a few lines stating the American colonies actually had tea before the British did. I was surprised to read this could be a possibility since it's not like tea drinking is an American pastime. But it turns out there are good reasons for this, which I'll get to in a bit. It arrived at the settlement of New Amsterdam. Although there is no specific record of the first instance of tea consumption in America, it was being consumed in the settlement by the time Dutch East India Company Director, Peter Stuyvesant, arrived as governor in 1647. Early records show the custom of taking tea by the upper class of New Amsterdam proved equal to that of their native Holland. The tea tray, tea table, teapots, sugar bowl, silver spoons and strainer were the pride of the Dutch household in the New World. The cost of tea was high and it was fashionable for the rich families of the time to take tea in the afternoon with a small meal. In 1664 the British took control of all the Dutch settlements in the New World, and tea continued to grow in popularity. And afterwards I did send for a cup of tee (a China drink) of which I never had drank before, and went away. His entire diary entry for the day can be viewed here, if you're interested in reading it. So it seems to me from looking at the recorded history that Americans started drinking tea before the British. One of the teas consumed during colonial times is Bohea, which is a blend of black teas from from Wuyi mountains in Fujian. (the area was referred to as Bohea, which could be due to pronunciation). Most resources seem to think bohea tea would have contained some smoky lapsang souchong. It was a blend of cheaper grade teas and the most popular type to drink. It was so popular that bohea also became a way to refer to tea in general. If you're curious about this tea, a few tea vendors sell their own bohea blends today. A quick google search will come up with a few options. I think I may have to try some. There were also green teas at this time such as hyson, singlo, and gunpowder. 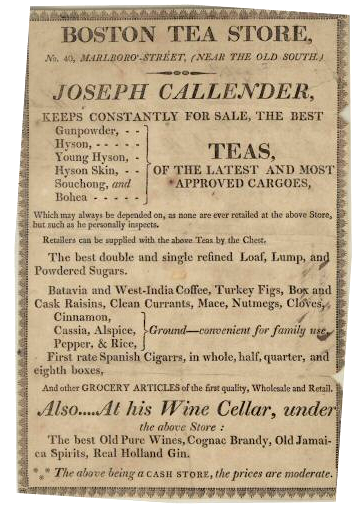 It would take a few blog posts to discuss the teas the American colonists consumed, but you can read all about them here. I am curious to learn more about singlo in particular, since it's not a tea I've ever heard of before. But I'll save that for a future post, especially if I end up reading this book by Robert Fortune to learn more about this subject. As tea became an established custom in colonial American society, it was drunk in the morning, at home and socially in the afternoon or early evening. 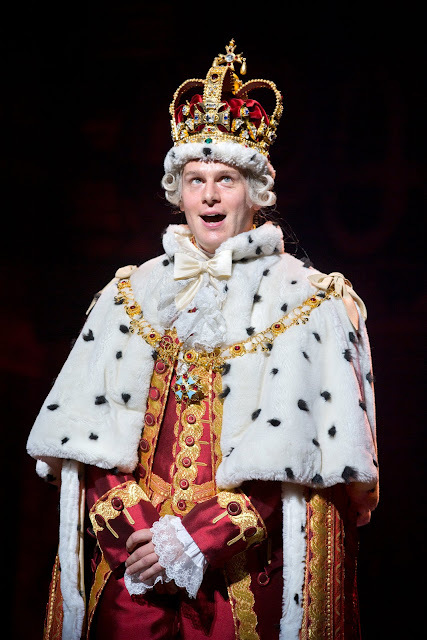 According to Benjamin Franklin, "at leas a Million of Americans drink Tea twice a Day." Another contemporary estimated that one third of the population drank tea twice a day. All this tea love was brought to a screeching halt for a few related reasons. The taxes placed on tea and the monopoly the East India company held on importing tea created gangs of tea smugglers who sold cheaper tea to the colonists. 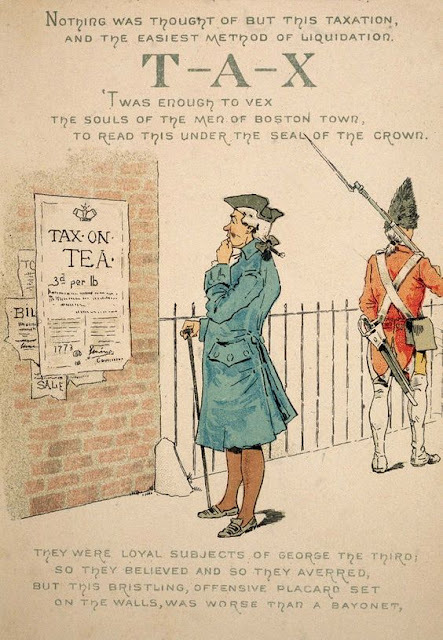 With the Stamp Act taxing goods including tea, colonists began to boycott British goods and tea sales declined. Americans started steeping 'Liberty Teas' which were essentially herbal replacements (I think a blog post on Liberty Teas is necessary!). The decline culminated in 1773 with of course, the Boston Tea Party. There's much more to say on the matter, but to keep this post from getting too dense, I'll just say tea wasn't exactly fashionable after all of the political events of the time. If it weren't for good 'ol King George III, and the East India company, we may be drinking just as much tea as our friends across the pond. Thankfully today we have significantly fresher teas (can you imagine drinking teas that were transported and stored for months and months before making it to your cup?) and a huge variety available! Interesting American tea history. I had wonderful read on this one, such a great opportunity of reminiscing the remnant of fashionable drinking of teas. Thank you Georgina, I'm glad you enjoyed it. I nice to know the a glimpse history of tea, thanks for sharing!